As important as good brushing habits are to oral health, it can be tough to get the kids to put in the required two minutes of quality brushing before bed and after meals. Brushing is so boring, right? Well, it doesn’t have to be. With the right tech tools, brushing can be turned from a chore into a fun game or light-hearted family competition. Here are three ways to make brushing more fun for kids. Grush, short for “Gaming Toothbrush,” is a special motion-sensing toothbrush that doubles as a game controller. 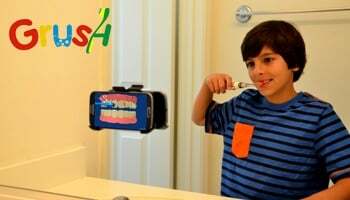 As kids move the brush up and down in their mouths, data is transmitted wirelessly to a nearby mobile device running their choice of specially designed Grush-enabled games that promote good brushing habits. In Monster Chase, for example, kids are tasked with brushing away virtual monsters that hide and appear between their teeth. In another game, brushing helps raise a virtual pet. For Parents, Grush offers a suite of tools to track your kids’ brushing. Not only will you get data about when your children brush, but you’ll also know how well they’re doing it and for how long. This information can, at your option, be sent to your child’s dentist for review. Grush is currently being offered on crowdfunding site Indiegogo starting at $30. If Grush meets its $50,000 goal, the interactive toothbrush is expected to ship in March 2015. 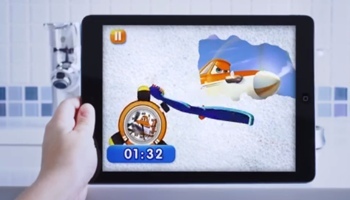 If brushing fails to keep your younger child’s attention for the recommended 2 minutes, the free Oral-B Disney Magic Timer app for iOS and Android may be just what the dentist ordered. As your kids brush with the app, they’ll slowly reveal a new picture of a popular Disney or Marvel character as a timer counts down on screen. Only when the full 2 minutes of brushing are up will the full image be revealed. Completed pictures are saved to an in-app notebook, giving youngsters a sense of accomplishment as they keep their teeth healthy. The Disney Magic Timer app is free to download, though a Crest or Oral-B Pro-Health Stages toothbrush is required for its use. A more mature Oral-B timer app for adults is also available. If your kids are entering their teens, Disney characters and virtual pets may not cut it. For them, check out Beam – it’s a smart toothbrush with a more adult feel and look. The Beam smart toothbrush comes in your choice of blue and pink colors and is powered by an AA battery. Brushes can be ordered at beamtoothbrush.com for $24.99; replacement heads can be purchased for $3.99 each.